The Foo Fighters have just released a video that’s thematically on point for this week of significant astronomical occurrences (no matter what Neil deGrasse Tyson says). 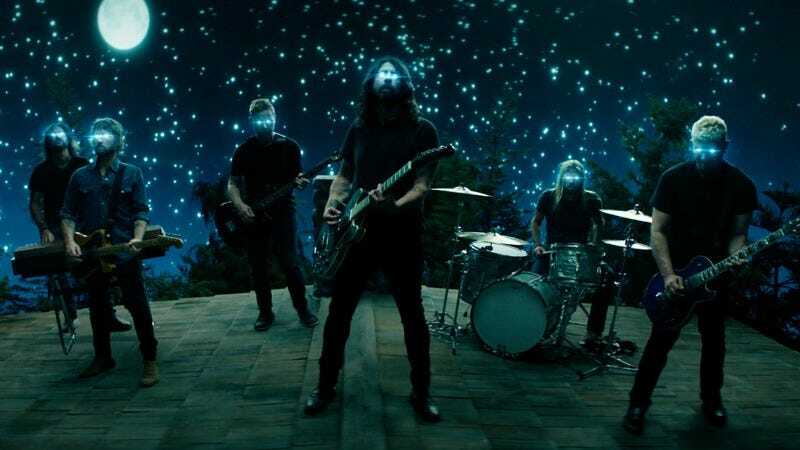 Dave Grohl directed the video for “The Sky Is A Neighborhood,” a track off the Foos’ upcoming Concrete And Gold album, and it shows the band raising heaven on a roof somewhere. The song’s rousing chorus both delights and annoys the young girls (played by Grohl’s daughters) reading the lyrics in a book before eventually going on a Peter Pan-like journey. It’s not particularly inventive, but this booming track certainly lives up to Grohl’s promise that this album will be the “biggest sounding Foo Fighters record ever.” You can hear the influence of Greg Kurstin, who’s worked with Katy Perry and Adele, in the stirring melody. After Rickrolling audiences this summer, the Foo Fighters will be properly on tour starting in October. Concrete And Gold drops September 15.